Back in college, my friend John and I used to regularly visit the Red Lobster in Ypsilanti to partake in Shrimp Lovers' Tuesday -- a magical event this side of Cheddar Bay when you can get 40 pieces of shrimp for under $20. I always ordered all scampi. Well, John is back in town before heading off to grad school, so we hit the Red Lobster in Madison Heights, not only for old times' sake, but also to document the shrimp consumption system I developed over the course of those magical nights. Here it is, fully documented for the first time. 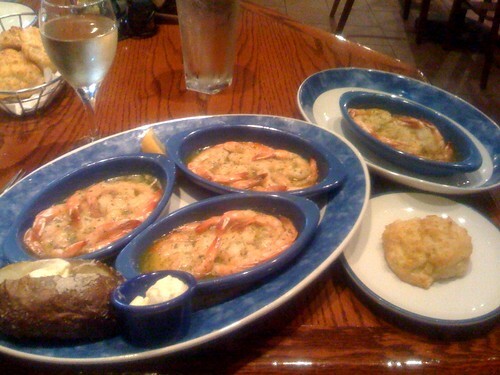 Order as much shrimp as you possibly can. 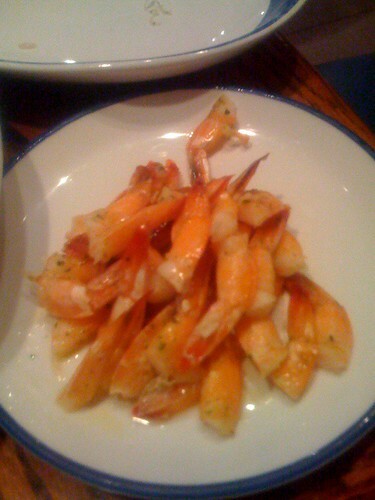 On a Tuesday at Red Lobster, that means four orders, or 40 shrimp. You must order a baked potato and you must order it without sour cream. You’ll see why. If you are a particularly unreasonable person, you can order more than one meal. The only proper beverage to wash it down with is a white wine, because everyone knows shrimp and white wine go great together. I prefer the Riesling. 1. The first step is to eat all of the shrimp bodies and set the tails aside. Don’t worry; you’re saving all the tail meat for later! 2. As the trays of delicious garlic butter become devoid of shrimp, you can use them and their contents to saturate your baked potato. This is where the system really starts to work. Pay close attention. 3. 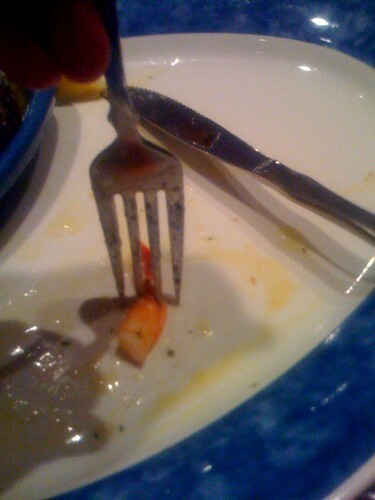 Take your fork and stab it through the shrimp tail just behind where the meat runs out. 4. Insert your butter knife under the end of the tail to pry up the shell. Pull the fork away. 5. 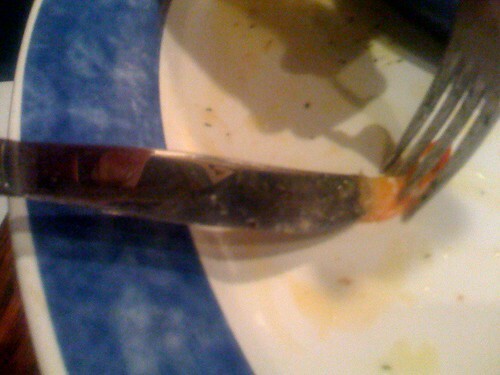 Holding the end of the knife at the base of the meat where you initially inserted the fork, use the fork to extract the delicious meat. 6. Enjoy the meat that you have successfully saved to savor without getting your hands dirty. 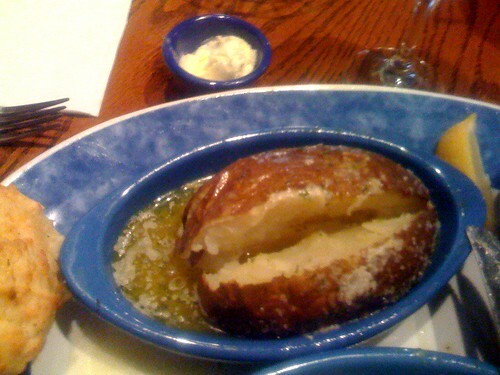 Now as a reward, dig into that garlic-butter-saturated baked potato. If you can’t finish it and your friends call you out, remind them to shut their fool mouths because they sure as hell didn’t just eat 40 pieces of shrimp. So, there you have it folks. I encourage you all to transport your taste buds to the sea shore with a delicious order of shrimp scampi, and to get the most out of it with my shrimp system. Bon appetit! Dude, excellent system. Also lulzing at the fact you refer to yourself as 'journalist' in your about me. Very nice. I don't usually like shrimp, but now I know how to properly consume them and will perhaps try out your system. Thanks. I don't know if your system will work for me. 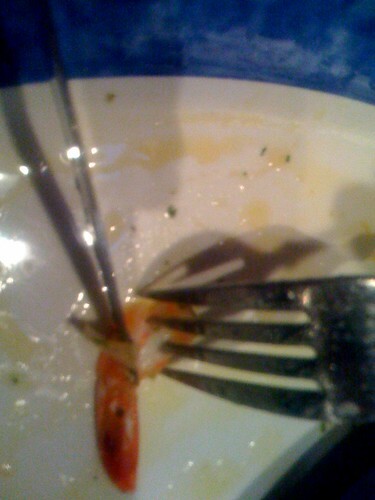 For you see, for some horrible reason, I enjoy eating shrimp tails. I think of them as delicious shrimp crackers that wind down the meal after the bulk of the shrimp meat makes my stomach feel heavy. I've tried leaving some of the tail meat in the shells (like the early steps of your system), but it doesn't always have the same effect as eating the empty tail shells. Perhaps some more experimentation is in order..... to the ocean!!! i love the system and also the bonus potato. i think i will do that next time i go to The Lobster, instead of just picking up the butter filled shrimp boat and guzzling down the extra scampi butter.